Few places in the world can offer a similar landscape like the spectacular fjords of Western Norway. The pristine mountains rise steeply from the fjords with thundering waterfalls cascading down their sides. Along the fjord you can see multiple farmyards, which is a reminder of a time when the fjord was the most important transport route in the area. As one of two fjord regions in Western Norway the Naeroy­fjord was registered on the UNESCO World heritage list in 2005. The fjord is 17 kilometers long and only 250m wide at the narrowest point. Only areas that have especially unique nature or cultural significance have been given the honor of being featured on the UNESCO World Heritage list. This seven day fjord adventure package, will give you a great taste of what this amazing area can offer. 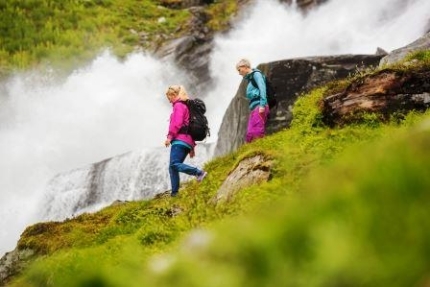 By exploring the fjord, eating local food, learning about local culture, hiking and biking in the mountains and sea kayaking in the Nærøyfjord - you will get an active and authentic experience of the fjords of Western Norway. The trip is a roundtrip, where you will be travelling on foot, bike, sea kayak and by boat, train and some short distances by bus. The hikes are at a moderate level, with duration from 2 – 7 hours. This is not a trip intended for “expert hikers”; people with a moderate fitness level will enjoy this active round trip!